Now we are all aware of the benefits of standing desks. A standing desk might not help us lose weight but there are some potential health benefits like the lower sugar blood level or the reduced risk of shoulder and back pain, obesity, and diabetes. However, many people might be hesitating to make the change because they’ve already had a desk setup and it might be costly to upgrade to a standing desk. Bestek is offering a table-top height-adjustable standing desk and it might be an ideal choice for most of us. Moreover, they are holding a giveaway and participants from many countries are free to join. 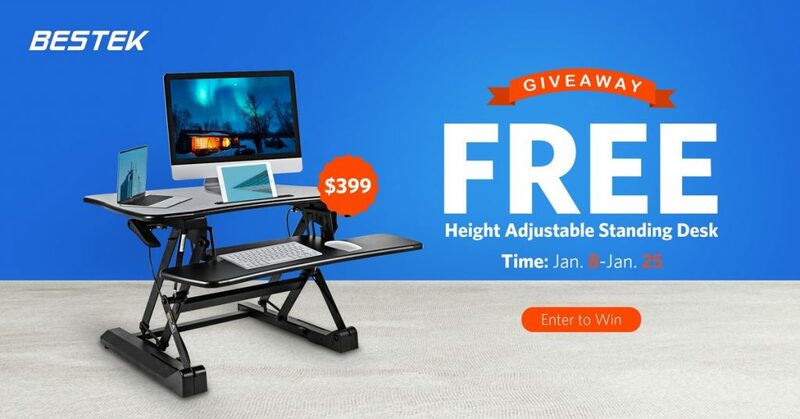 The standing desk is valued at $399 and now we have a chance to grab it for free. You will just need to visit this page, join their newsletter by providing your name, email address, and clicking on Subscribe to enter the giveaway. There will be 50 winners in total and they will be announced on January 27th. The event runs from January 8th to January 26th 23:59 PDT, so you can join right now.